When I was a kid, I got a Sparkle Pony name Twinkler. I thought she was so unique, as sparkle ponies were a new concept back then. The tinsel hair was an added bonus. I also got a Princess Primrose, who was not a Sparkle Pony but one of the Princess Ponies. Well, now that I’m much older, I still have them both, and they’re still in pretty good condition. But now I’ve acquired two more G1 Sparkle Ponies named Sky Rocket and Star Dancer. 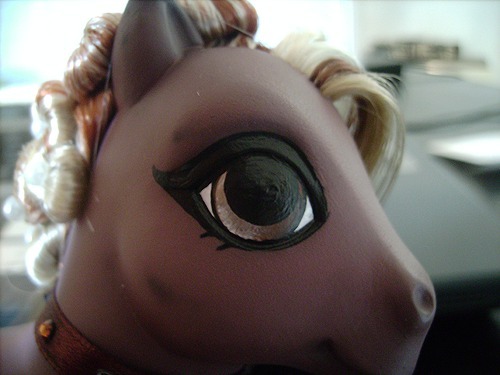 The two new ones are missing tails and almost no mane hair – they look more like Mr. T right now than ponies! Sky Rocket is also suffering from serious tail rust, but that’s for another post. So, I’ve been on a hunt for replacement tinsel. 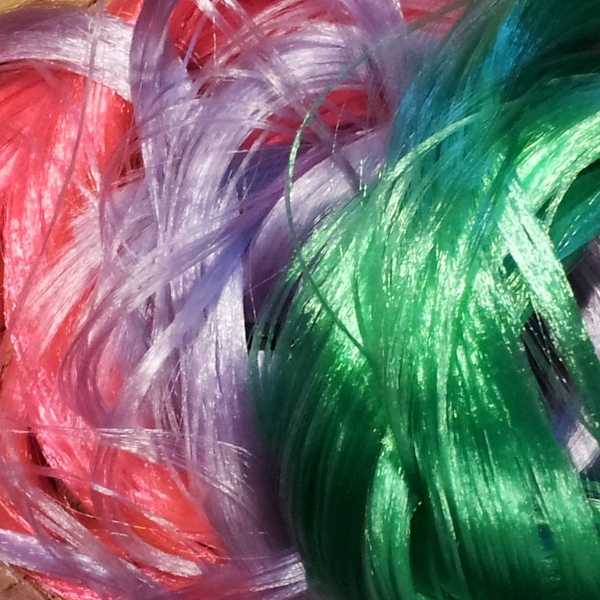 For regular replacement hair (and custom colors) I recommend Dolly Hair for regular pony hair. According to Tina the site owner, they have genuine MLP hair, same as what Hasbro uses – and I have no reason to doubt her! So far I’ve been able to find exact matches for everything as far as the hair is concerned. Unfortunately, the tinsel is another matter! I’ve had some success matching Sulky thread to the pony tinsel. My local store, Hancock Fabrics, only had some of their colors in stock. I found that Princess Primrose’s pink tinsel did not quite match the dark Sulky pink. The Multi Color #145-8024 appears to be an exact match to Twinkler’s multi colored tinsel. If there are differences, I couldn’t find any. I also was able to match Sky Rocket’s tinsel exactly to the Sulky Dark Blue. It was difficult to get a clear photo of them because the tinsel reflects colors differently, and capturing that on camera was a challenge. You can see it pretty easily with Twinkler anyway. Sulky Light Pink metallic thread #145-8033 will match Star Dancer’s light pink tinsel. I should also mention that Twinkler (pictured above) was kept in a box for about 25 years, so she hasn’t really had any fading issues. I’m not so sure about Sky Rocket or Star Dancer. So Where Can I find Hair Tinsel? Obviously restorations require a good match in color, but whether it’s a restoration or a custom pony, you can find many colors are out there. First, check your local fabric or craft stores for tinsel thread. Sulky makes the brand I have pictured here, but you may find a different brand. The next place you can check is a hair supply store – some of them might carry hair tinsel. Depending on the time of year, you can also use Christmas decoration tinsel. I haven’t tried this particular kind myself. I don’t know if the decoration tinsel is more likely to break or not, but others have said they’ve used it. Finally, you can find it online. 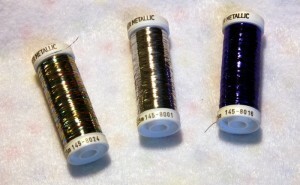 There’s Sulky Metallic Thread on Amazon , the Sulky web site has links to online retailers, and there’s plenty of sellers on Ebay. The downside of that is that you can’t hold it up to your pony to compare colors, but the upside is there are a lot of sellers to choose from!